Gunter Kast spends time at the Danakil Depression in Ethiopia in Tanz auf dem Vulkan. Please note this article is written in the German language. Often referred to as one of the most inhospitable places on the planet given the temperatures, lack of rain and proximity to an active volcano, the Danakil Depression is home to the Afar, a people who continue the one of the World’s oldest trade – the salt trade. Spending a night on the rim of a volcano, a place that doesn’t find its way into most Ethiopia tourist itineraries, Kast is treated to a the heat and the toxic gases of the volcano in the company of some of Ethiopia’s most fearsome people. 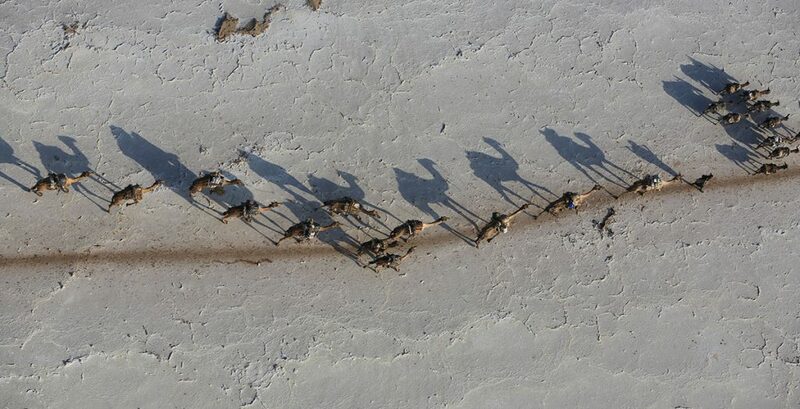 If you’re interested in a luxury helicopter safari holiday to the salt pans of the Danakil, please do get in touch with one of our destination specialists, who would be happy to help plan a trip.